This is the Western Wall of the Temple Mount from Herod's time period. The gold domed building on the mount is The Dome of the Rock, an Islamic mosque over the sight where many believe Abraham was about to sacrifice Isaac. The actual site of Solomon and Herod's Temple is debated. Some hold that the mosque sits over the exact site of the temple, but some believe that the Dome of the Rock, which is centrally located on the mount, is not the site of the temple. They argue that Herod greatly expanded the size of the temple mount built by Solomon, but he did not move the actual site of the temple to the center of the new, larger mount. However, the claim that the rock is the site of the temple has recently received new support. An article published by Leen Ritmeyer claims that indentions where the ark of the covenant was placed can be seen on the rock inside the Dome of the Rock. The arch to the left of the picture is in the location of Wilson's arch, but it seems that most of the arch is a reconstruction, and not from the time of Herod. 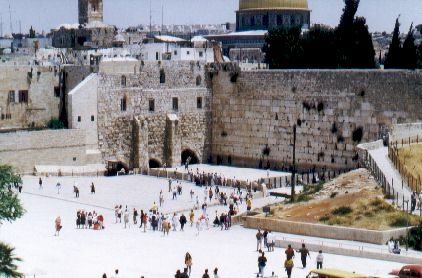 Robinson's Arch is to the right of the Western Wall, as well as The Pinnacle of the Temple. A close up of the Herodian Stones at the bottom of the Western Wall can also be seen.